Editor’s note: This post is the third in the NextBillion series Going Off Grid. To read other contributions in the series, click here. Africa has seen significant economic progress in recent years, with many of its countries enjoying growth rates among the highest in the world. This progress is even more remarkable considering that vast regions of the continent are without electrical power. According to the Electrify Africa Act of 2013, nearly 30 African countries face endemic power shortages, which present a key constraint to growth. It is believed that with a plentiful electric supply, Africa would enjoy an additional 2 to 5 percent of economic growth annually – a robust figure for any part of the globe. In Sub-Saharan Africa almost 600 million people — about 70 percent of the population – lack a regular source of electricity. That’s roughly equivalent to the entire population of Western Europe, plus Japan and South Korea. That such a vast population lives without power clearly affects their quality of life – limiting the production of goods, agricultural output, the delivery of quality health care, commercial activity and many other aspects of life and work – yet at the same time offers tremendous upside potential should electrical generation and distribution become widespread across Africa. What’s more, recent history shows that powering Africa is not only possible, it has become a major business opportunity for U.S. companies which are achieving success through innovative projects in a number of African nations. For example, in Hell’s Gate National Park, Kenya, the Olkaria geothermal power plant – built and operated by Nevada-based Ormat Technologies Inc. – was recently expanded. The park contains volcanoes and abundant hot springs, which are tapped to produce electricity. The hot steam is transported from the site through a pipeline, which has been elevated in several places to accommodate giraffe migration. Ormat uses a proprietary technology to re-inject cooled water into the reservoir to minimize the impact on the environment. In 2011, OPIC approved up to $310 million in financing for the plant’s expansion. Since Ormat’s expansion from 48 megawatts to 100 megawatts, the plant has been able to deliver more than 5 percent of Kenya’s total power consumption. Geothermal already accounts for 13 percent of Kenya’s electric generation, and is expected to top 25 percent by 2030. 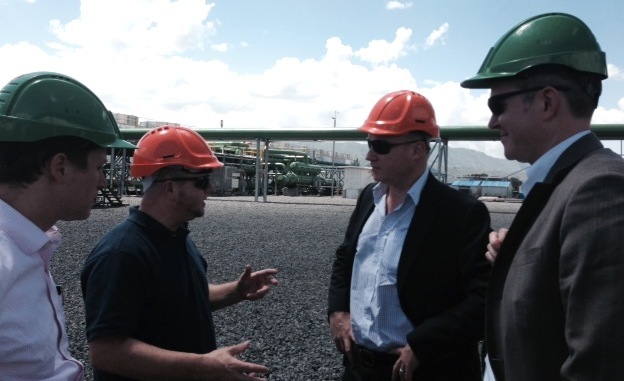 In addition to bringing much-needed power to the region, Ormat’s plant is creating jobs in both Kenya and the U.S. Meanwhile, just outside of Togo’s capital city of Lomé, Delaware-based CountourGlobal has built a 100-megawatt thermal power plant which can readily switch between natural gas and fuel oils based on availability and cost. The plant provides a reliable source of electricity to a country that had one of the lowest rates of per capita energy consumption in the world. The completion of this plant in 2010 tripled Togo’s electricity generation capacity – the construction itself was a major undertaking in one of the world’s least developed countries. The project was completed with the support of $250 million in OPIC financing and $37.8 million in political risk insurance. In Kigoma, a rural area of Tanzania, only 6 percent of the population has access to electricity. NextGen Solawazi Limited is addressing this deficiency through plans for the construction and operation of a 5-megawatt photovoltaic solar generation plant. The use of clean solar technology will reduce regional carbon emissions by replacing diesel power generation. Tanzania is also making progress in another renewable energy sector, with Washington, D.C.-based KMR Infrastructure’s development and operation of two distributed biomass generation plants. The construction and operation of these small-scale renewable energy projects is expected to be highly developmental for the people and economy of Tanzania. (OPIC’s projects are scored on a development matrix for development impact. “Highly developmental” is a level of this matrix. Find out more here). The plants will displace diesel generation with green energy – from bamboo – in underserved rural markets, while offering new revenue opportunities to local landowners through fuel supply arrangements. The innovative and scalable model for power that these plants provide will generate power that is decentralized from the country’s primary grid. Renewable power projects like wind, solar, geothermal and biomass, combined with traditional thermal power sources, will be essential to illuminating the continent. As these ingenious projects demonstrate, there are multiple ways to bring power to Africa. This is a tremendous opportunity for the public and private sectors in the United States to come together to create a brighter, sustainable future with and for the people of Africa. Judith Pryor is the vice president for External Affairs at Overseas Private Investment Corporation (OPIC).